Out of the colleges that responded to our survey, CVS and St. Stephen’s were the only two co-ed colleges that provided common rooms for both boys and girls. Read on to understand their importance. We, as Indian students, have embraced the fact that the quality of our lives and education will never improve. Part of it could be traced back to the administrations’ unswerving and unwavering faith in the ideas of denial – both in terms of denying to acknowledge the pathetic state of infrastructure, and denying the students their rights. From a broader spectrum, it is almost mandatory for institutions to provide privacy to the students enrolled, and common rooms are only an extension of it. Why, then, must a premiere institute like the University of Delhi grossly lag behind? One (or two) common room(s) in each college of the University is actually not asking a lot. Here, the common narrative of the fees being INR 5,000 will be spewed again. But the fact of the matter is that a public university, run by the central government, has sufficient amount of funds, which again, we are paying as the tax. There are, of course, girls’ colleges like Lady Shri Ram, Jesus and Mary, and Vivekananda that provide students with common rooms. And others like Ramjas, Khalsa, Hansraj, Rajdhani, and Moti Lal Nehru College that provide common rooms to just girls. But most of the other DU colleges fail to follow suit. 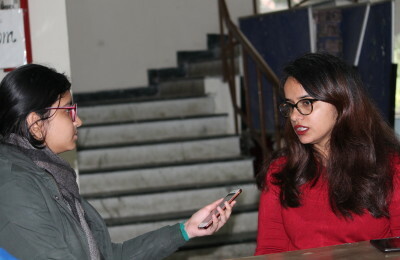 “During the process of upgradation of college campuses in their structural capacity, these common rooms should be promoted to provide a space to the students in the campuses, which besides studies and sports, allow them to unwind the day while maintaining their privacy,” says Aeshal Nisar Dalal, President, CVS Students’ Union. these rooms is a sorry state of affairs, altogether. “The common rooms are as good as non-existent! The management and the union, every election season make hollow promises to improve the ill-maintained rooms but it continues to remain in shambles,” confirms Kshitij Naagar, an English student in his first-year. Representatives from the Students Union of St. Stephen’s were, unfortunately, were not available to comment. While CVS must be appreciated for their action towards student-centric ideologies, there is still a long way to go. As far as the other colleges are concerned, it is about time that they learned from CVS, Stephen’s, and the above-mentioned girls’ colleges, and respect basic human dignity by essentially normalising the process of giving students their rights. Previous PostLetter to My Outgoing Best-friend Next PostAm I Imposing Myself on You?